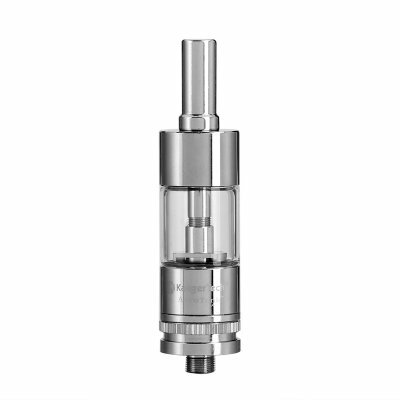 Successfully Added KangerTech Aero Tank Atomizer - 3.5ml Capacity, 2.0 Ohm, Stainless Steel, 510 Thread, Rebuildable Tank And Atomizer to your Shopping Cart. The Aero tank atomizer from KangerTech allows you to upgrade your current vaporizer and take your vaping experience to the next level. Crafted out of durable stainless steel, this atomizer and tank feature a durable and stylish design – making it not only appealing the eye but also tough enough to handle the impacts of everyday life. For everybody out there that is searching for a way to significantly increase their vaping experience by upgrading their current vaper mod the Aero tank atomizer is the perfect little vaping accessory as it brings along countless of benefits – allowing you to take the most out of your upcoming vaping sessions. Thanks to KangerTech’s unique design, no glues or any chemicals were used in assembling the Aero tank atomizer. Not only does this bring along health benefits, it also allows you do disassemble this beautiful atomizer and to replace each and every of its parts in case necessary. Additionally, its detachable design also makes this little atomizer easy to clean, allowing you to take the absolute most out of your vaping experience as this high-end atomizer will provide you with a clean and well-flavored vape for countless vaping sessions to come. Simply fill up the 3.5ml tank with your favorite taste of e-liquid, insert the atomizer into your vaporizer, and you’ll be all set to enjoy countless hours of tasteful vaping sessions. Holding up to 3.5ml, this tank lets you fill it up with plenty of liquid – ensuring that you’ll never be left without juice while enjoying a relaxing vape. Featuring a state of the art air flow control system, the Aero tank atomizer from KangerTech allows you to efficiently adjust the airflow by simply rotating its bottom part – letting you adjust your vapor experience to your exact personal liking. Resistant up to 2.0-ohm, this vaper atomizer is capable of handling high amounts of Wattage. Not only does this allow you to enjoy your favorite taste of e-liquid without experiencing a burned taste, it also lets you produce magnificently large vapor clouds that are sure to impress all your friends and people standing by. Additionally, this atomizer supports 510 threat connections, bringing along plenty of options for you to choose from when this nice little accessory is applied to your current vapor. Perfect to be used to upgrade your favorite vape mod kit – this rebuildable atomizer and tank is the perfect vape accessory that is guaranteed to increase the vaping experience of beginners and advanced vapers alike. The Aero tank atomizer comes with a 12 months warranty, brought to you by the leader in electronic devices as well as wholesale electronic gadgets..
Arabic: - رذاذ فب - Chinese Simplified: - Vape 雾化器 - Czech: - VAPE Atomizer - Dutch: - Vape verstuiver - French: - Atomiseur de Vape - German: - VAPE Zerstäuber - Hebrew: - Atomizer ב Vape - Hindi: - Vape हाथ की पिचकारी - Hungarian: - VAPE porlasztó - Italian: - Atomizzatore di Vape - Japanese: - アーク プラズマ蒸着法アトマイザー - Korean: - Vape 분무기 - Malay: - Pengabut Vape - Norwegian Bokmål: - Vape Atomizer - Romanian: - Vape atomizor - Russian: - Vape Атомайзер - Spanish: - Atomizador de vape - Thai: - ฉีดน้ำ Vape - Turkish: - Vape Atomizer - Vietnamese: - Vape phun.